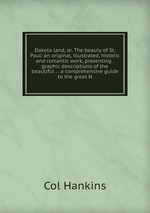 Аннотация к книге "Dakota land, or, The beauty of St. Paul: an original, illustrated, historic and romantic work, presenting . graphic descriptions of the beautiful . . a comprehensive guide to the great N"